Whether you’re in the inner city, suburbs or on acreage, keeping bees can be easy, low-fuss and fun for the whole family to get involved in – imagine bottling your very own honey! 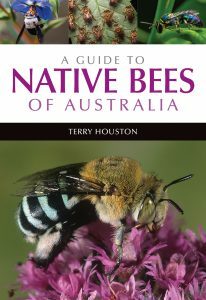 This lively guide features inspirational experiences and gorgeous photos from scores of enthusiasts across Australia who have sweetened their lives by keeping bees. 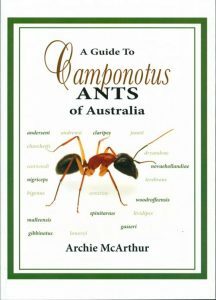 Practical chapters by a range of experts give the low-down on getting started, caring for your bees, harvesting your honey and wax (with recipes), troubleshooting, what to plant to help out your little workers, and great information on the popular option of keeping native stingless bees. 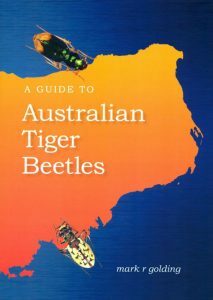 Discover the beauty and diversity of Australia’s native bees. Bees are the darlings of the insect world. It is a joy to see these insects hard at work, peacefully buzzing from flower to flower. 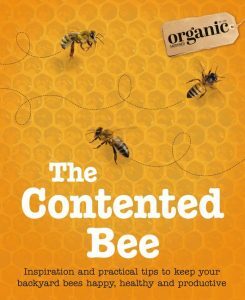 Many people recognise the worth of bees, as well as that they face multiple threats. But very few know about the diversity and importance of our native bee species. 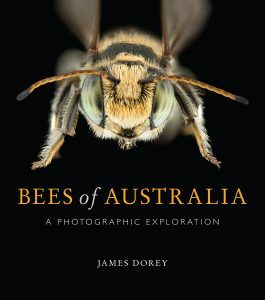 There are an estimated 2000 to 3000 bee species in Australia, yet we know very little about the vast majority of these and there are many that are yet to be described. Part six in a series of ten to twelve which will cover the 2,000 species of Victorian moths. This part covers the Ghost moths and allies. Part one (see stock ID 12326), part two (12327), part three (13042), part four (13697), part five (14144), part seven (16381), part eight (16379). Part seven in a series of ten to twelve which will cover the 2,000 species of Victorian moths. This part is the final of the geometrids covering the bark moths and others. Part one (see stock ID 12326), part two (12327), part three (13042), part four (13697), part five (14144) part six (16385), part eight (16379). Artist/Author: Marriott, Peter et al. 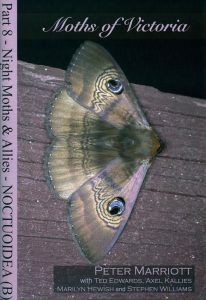 Part eight in a series of ten to twelve which will cover the 2,000 species of Victorian moths. 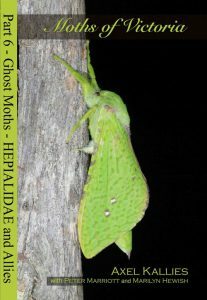 This part is the second book for the diverse superfamily Noctuoidea covering the family Euteliidae and parts of the families Erebidae and Noctuidae. The accompanying CD contains over 300 additional pages of information. Part one (see stock ID 12326), part two (12327), part three (13042), part four (13697), part five (14144), part six (16385), part seven (16381). 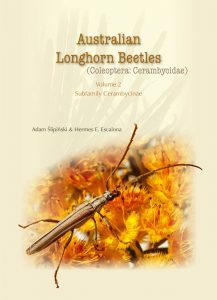 The first reference to describe the 70 hepialine Hepialidae species in Australia. The Hepialidae (Ghost Moths) are a family of often spectacular micro-moths. 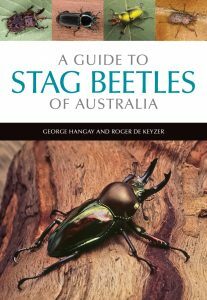 The Australian region is one of the hot spots for hepialid diversity and the fauna is divided into three groups: primitive Hepialidae with small, often overlooked species; oxycanine Hepialidae, containing the large and poorly known genus Oxycanus and its allies; and finally the hepialine Hepialidae, which span from stunning, green Splendid Ghost Moths in the genus Aenetus, to the enormous moths in the genera Zelotypia and Abantiades(which include some of the most impressive insects in the world), to smaller, drab pest species in the genus Oncopera. 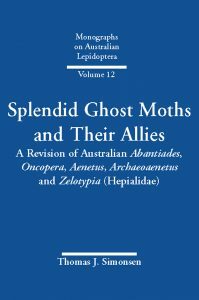 Splendid Ghost Moths and Their Allies is the first work to provide comprehensive information about the taxonomy, biology, diversity and morphology of all 70 Australian hepialine Hepialidae species, including the descriptions of 15 species and one genus new to science. 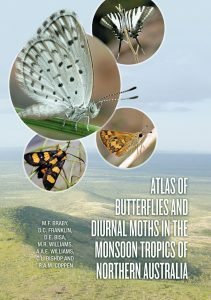 Each species is illustrated with colour photographs of males and females and drawings of the genitalia, and the book also contains identification keys to genera and species. Distribution maps and detailed information on where each species is found are included, as well as a species richness map for the group in Australia. 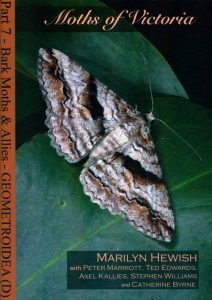 This book is an invaluable reference for moth enthusiasts, professional entomologists and nature conservationists alike.